If you have money stress, you are NOT alone. A recent study shows that 41% of millennials are stressed about money. The results are likely similar across most age groups. Times have been tough in this economy for the past few years, and they are slow in recovery. Many people live paycheck to paycheck and are unable to accumulate any kind of real savings. So what are some things you can do? Real action items to help the mounting money stress. First of all: talk about it. 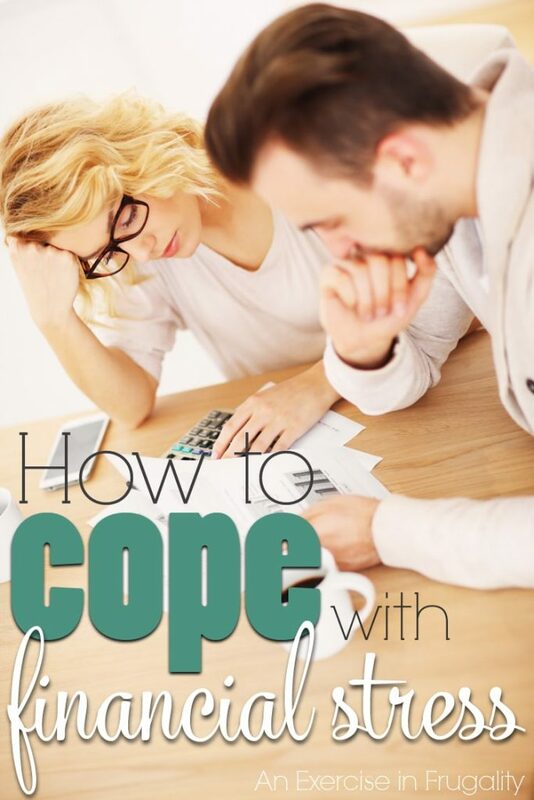 When my husband and I were having money problems last year, we sat down and had a real conversation. No yelling, no theatrics, just a real honest “come to Jesus” talk. Its important not to place blame or get defensive. Just come to the table ready to talk real solutions. Be prepared to think (and act) outside the box. Chances are, doing what got you into this financial situation isn’t working…and will continue to not work if you continue to repeat that path. Start to brainstorm realistic things you could do differently. Is it possible to get a part time job or side hustle? Can you carpool? What about starting to really crack down and use coupons religiously? People are always suggesting ways to cut your budget which many of us have ALREADY done and are still in tough financial spots. Think very seriously about your day to day spending and expenses. It might not be a glamorous solution, but sometimes really getting into the nitty gritty (remind yourself its only temporary) can help mend an impending financial mess. Maybe this means getting a roommate, or downsizing your apartment, or selling your car. They may not be ideal solutions, but if it means less stress its worth considering! Create a realistic action plan then IMMEDIATELY act on it. Don’t wait. This is not something you can start next month, or next Monday. You need to just take the leap and get started. The more you put it off, the harder it will be and the more damage you will continue to do. Something I have always struggled with, is feeling like I have to possess certain things (or a certain quantity of things) to feel validated. I grew up in a comfortable upper middle class home. When I moved out on my own, I didn’t have the option of depending on my parents but I was used to a certain standard of living. I felt like if I couldn’t mirror that myself then I was worthless. I don’t know a single 20 year old who is well off enough to have all the modern luxuries, but I put a huge pressure on myself and wound up in debt and feeling like a failure. Don’t do what I did. Money and things don’t define you, and will never make you happy. The only thing you need to figure out is how much you need to keep a roof over your head, food on your table, and keeping your family healthy. The rest is insignificant and the money stress is not worth it. I’ve discovered on multiple occasions that the people I envied the most (as far as having nice “stuff”, nice cars, etc) many times live outside their means, carry a ton of debt, and overall aren’t any happier or more financially secure. Many times there’s such a competitive nature among the upper middle class that they spend way outside their means trying to outdo one another. Often I saw examples of people my parents knew who would try to one-up each other because they felt they had to. Its a bad frame of mind to be in regardless of your income. It might mean a few months of extreme-belt-tightening and a little discomfort, but in the end the sacrifice will be worth it because you won’t have to stress about money as much. Make sure to make time for free fun, like walks, the beach or family board games. Look on Pinterest for ideas, and search for things people did for entertainment during the Great Depression. There’s SO many excellent ideas that people have been doing for hundreds of years. No matter how broke you are, no matter how bad things may seem…you CAN and you WILL get through it. Please don’t ever think your situation is beyond hope. There is always a way out, and there is always someone who cares and who has advice. If you feel like you’ve lost all hope, PLEASE do not hesitate to contact a crisis helpline, or suicide prevention hotline. No amount of money is worth taking your own life. What other ways do you cope with money stress? Where do you get your coupons at? I see them all the time online but they always want you to download stuff first, I don’t really feel safe downloading things to my computer. I know there are a few in the Sunday newspaper, but not sure if there’s enough to make the price of the paper worth it. I do get some from the Sunday paper-some of the good coupon sites post a preview the week prior so you know what coupons are in the paper before you buy. At the height of my couponing I would buy 5 papers a week if I knew there were good coupons we would use in there. It easily pays for itself IF the coupons are for things you will use. As far as downloading stuff, I have used coupons.com, redplum.com and smartsource.com for years for coupons. Most websites use one of those three and they are totally safe to use (My husband is an IT manager and is very cautious about what we download and we’ve never had problems with these). Some companies feature high value coupons on their website or Facebook page. Those are safe also as they are usually managed by one of the above 3 companies as well. I hope this helps! Good luck in your couponing journey!